iSEM is compatible with iPad 2 and later, iPad with Retina Display and iPad mini. Apple’s Inter-App Audio connectivity, AudioBus, Korg’s WIST and Apple’s CoreMIDI are all supported. Furthermore, iSEM is fully compatible with the Audio Unit Extension format. It can be directly launched in any Audio Unit host applications. 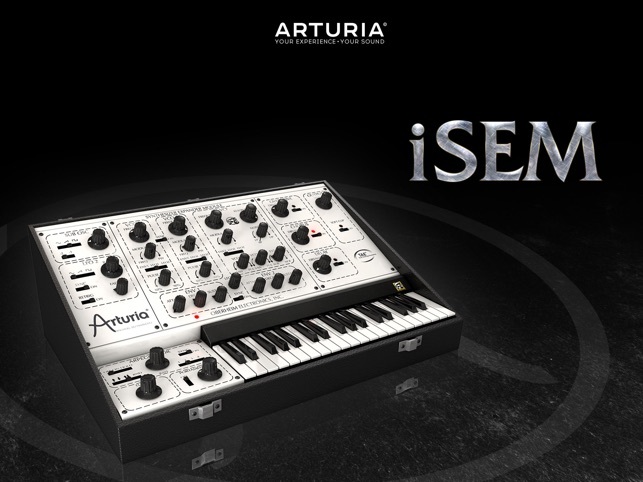 iSEM is a recreation of the classic 1974 Oberheim SEM (Synthesizer Expander Module), one of the world's first self-contained synthesizer modules and the first to bear the "Oberheim Electronics" name. The Oberheim SEM was made famous by artists and bands such as Lyle Mays, Jan Hammer, Joseph Zawinul, Supertramp, 808 State, Vince Clarke and Depeche Mode. 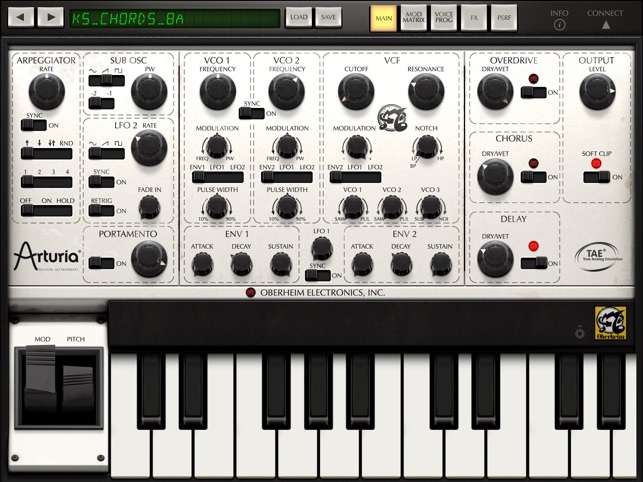 Based on the TAE® technology found in our Oberheim SEM V software, iSEM brings back the sound and special characteristics of this iconic synth in an sonically accurate and expanded touch-based emulation. What you can do with the iSEM? The iSEM is a powerful instrument capable of producing a wide range of warm analog sounds. 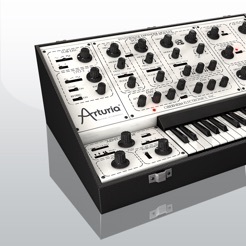 Reproducing the unique SEM architecture, with its oscillator sync, characteristic filter shape and specific envelope response, the iSEM is able to generate the fat basses that have made the Oberheim brand so popular. Thanks to its simple and clever PW and pitch modulations, it is also very easy to produce moving and lively leads. iSEM comes with over 500 sounds that you can browse through and play. 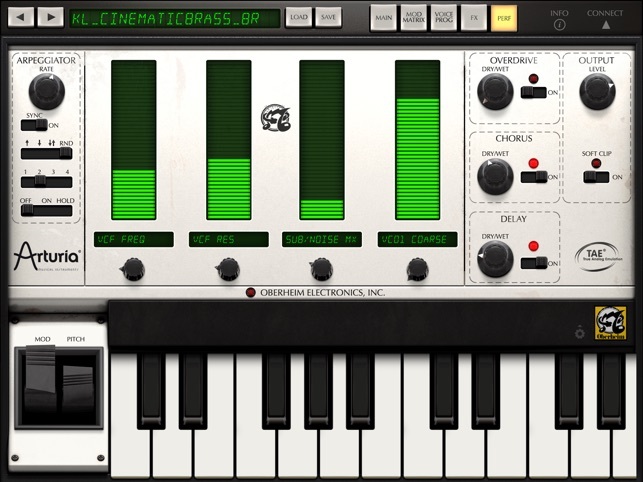 You can also easily create your own sounds with the easy to use interface. 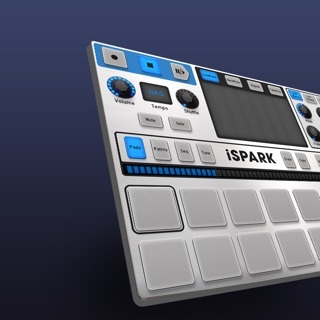 Play iSEM's numerous sounds from the iPad keyboard or control iSEM from a MIDI keyboard or other app via CoreMIDI and integrate it into your studio or live performance. If you are an owner of of the Arturia SEM V software on your Mac or PC, you can even import and export sounds between your laptop or desktop SEM V and iSEM. All the original parameters of the Oberheim SEM: two oscillators, each offering sawtooth wave and variable-width pulse wave with PWM, sine wave LFO, 12dB/oct multi-mode Filter with low-pass, high-pass, band-pass and notch, two ADS envelope generators. 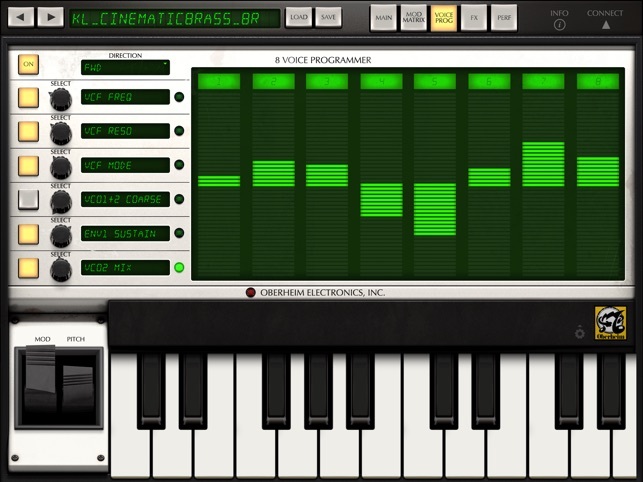 Added functionalities: New LFO, Noise, Sub oscillator, Arpeggiator, Portamento. Full user MIDI mapping of panel controls. Supports WIST sync to other iOS devices. Support of Audio Unit Extension, AudioBus and Apple’s Inter-App Audio connectivity. 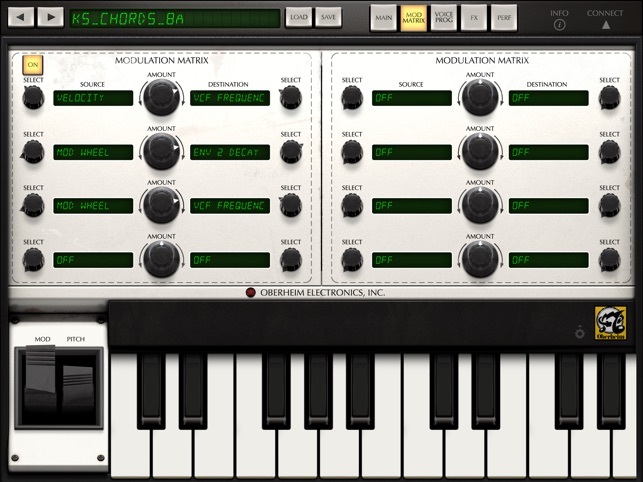 The Oberheim™ name used here is a trademark of the Gibson Guitar Corp. The trademark is used by license to Arturia. I would love to give this a better rating but a few things keep that from happening. I find it pretty crazy that you cannot set the pitchbend range in this day and age. I thought I must be missing the setting somewhere. When I sent a message to support about it I got no reply whatsoever but they did send me an advertisement about the matrixbrute. That's really not acceptable. I know that I didn't pay a ton of money for this but you can at least answer a simple question. 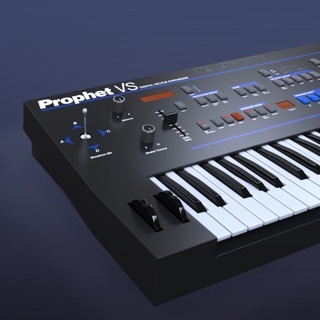 It's unfortunate because this synth really sounds great. If it had a pitchbend range setting, a responsive support staff and MPE support I'd happily give it five stars. If it just had pitchbend range I'd give it four stars. By the way I would happily pay for an in-app purchase for MPE and pitchbend range. 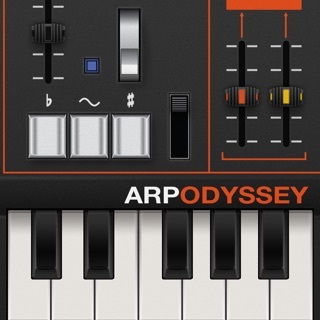 This is easily one of my top iOS synths. If you like old-school (Berlin school) style sounds, this delivers. Perfect for rippling sequences and dreamy pads. Interface is clear and it works fine for me with both audiobus and external sequencers. The best thing is that it has its own sound, quite rich and unique, especially noticeable when you have some modulation on it. Some of the patches were a bit too much for my iPad 3, especially when recording,but only some. On a Pro, it runs flawlessly. I judge a synth by how often I end up using it, and this one finds its way into most of my tracks. 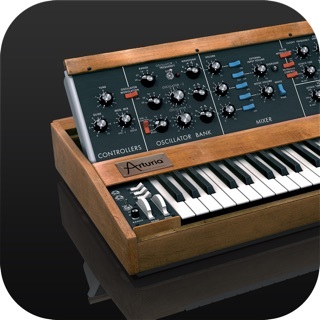 This is, and probably will always be, one of my favorite synth apps. For the most part it integrates well with AU host apps, but it has its shortcomings. First, it takes forever to load in GarageBand. Also if you have a MIDI controller mapped to adjust parameters using it as a stand-alone app, the controls won’t respond when using it as an AU, which makes it to where you can’t tweak sounds live using your controller unless you use IAA. Requires iOS 8.0 or later. Compatible with iPad.